This post is part of the 31 Days of Oscar Blogathon, hosted by Kellee of Outspoken & Freckled, Paula of Paula’s Cinema Club and Aurora of Once Upon a Screen. Click HERE for a list of the other posts for Week 2: The Oscar Snubs. Sylvester Stallone has TWO Oscar nominations (in acting categories). Alan Rickman died with ZERO Oscar nominations. Don’t get me wrong. I don’t begrudge Stallone’s nominations. I can’t even begin to express how much the Rocky character meant to me when the first movie came out. Crazy, right? I can’t recall ever reading a bad review of any of Rickman’s performances. Maybe they exist, but he was esteemed by most critics. That and the wave of emotion that washed over social media moments after Rickman’s death was announced would seem to indicate that he was one of our most valued actors. For some reason, the Academy never agreed with pretty much everyone else. I think the answer might be the rather dopey criteria for what constitute “Oscar-worthy” roles. We even have the term “Oscar bait” to describe these roles. British actresses are often nominated for playing roles in costume dramas, though actors not as much. This is probably due to the fact that actor categories tend to be far more competitive, mainly because men get more significant roles in films than women. Colin Firth won for The King’s Speech for playing royalty with a disability, and was nominated the previous year for playing a gay man. Truly, Madly, Deeply and Galaxy Quest fall under cult films. Galaxy Quest has the triple-whammy of cult, comedy AND sci/fi. (It also makes fun of Hollywood. Hollywood doesn’t like to be made fun of.) I believe Truly, Madly, Deeply was also originally shown on TV, which probably disqualified it from consideration at all. Die Hard falls under action movie, though perhaps if villain Hans Gruber had EATEN some of his victims, they would have taken it seriously as an Oscar-worthy role. Robin Hood: Prince of Thieves also falls under action movie, plus Rickman played (very memorably, in my opinion) the Sheriff of Nottingham with a comedic edge. Sense and Sensibility: this to me is the biggest mystery, because of all his roles, this is the one that came closest to “Oscar worthy” criteria. It was a pretty competitive year for supporting actor (Kevin Spacey’s iconic performance as Verbal Kint in The Usual Suspects won), which probably explains his omission. Also, he was a bit of a controversial pick for the role, which also may have hurt his chances, even though his performance was superb. This list is frustrating to review, because there have been rare comedic roles that have been rewarded, not only with nominations, but with WINS (most particularly, Kevin Kline’s well-deserved win for A Fish Called Wanda) and I’d match Rickman’s performances with any of those. Considering that both The Martian and Mad Max: Fury Road nabbed major nominations this year, it feels like Rickman was a victim of bad timing as far as action and sci-fi films. None of the Harry Potter actors were nominated, but Rickman’s interpretation of Snape is so on-point, and ultimately so poignant (I dare you not to cry when he says “Always” in the final film) that he absolutely should have been nominated. The good news is this kind of snobbery doesn’t rule other types of awards. Rickman received BAFTA nominations for Truly, Madly, Deeply, Robin Hood: Prince of Thieves (which he actually WON), Sense and Sensibility and Michael Collins (a movie I haven’t seen—need to put that on my list to watch in future). He also fared far better with his television roles, particularly Rasputin: Dark Servant of Evil and Something the Lord Made. He won an Emmy, Screen Actors Guild, and Golden Globe Award for Rasputin, and was nominated for an Emmy for Something the Lord Made. Where he portrays an American character with a very credible Southern accent, so NYAH-NYAH to you, Daniel Day-Lewis. Of course, Rickman died younger than expected and probably would have had some opportunities ahead of him to receive at least a nomination. Or, if he had managed to live into his 90s, the Academy would have pushed him onstage in his wheelchair and given him an honorary Oscar, because that’s what they do when they realize they’ve screwed up royally with their competitive categories. Which they clearly did in this case, so maybe it will be time for a séance in 30 years, Academy. Soooo many reasons to love Alan Rickman and it’s incredibly sad to ponder that he left this world without at least one of the Oscars he rightly deserved. 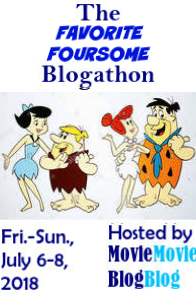 Thanks for participating in our blogathon with this passionate post, Debbie! I wholeheartedly agree with your rant! I agree with your assessment of what types of roles usually get nominations and wins from the Academy…not that I don’t enjoy them, but it would be nice to see some variety in the accolades, especially when truly talented thesps like Rickman get ignored. I absolutely agree that just because a role falls into one of those categories, it doesn’t mean it’s not great or doesn’t deserve a nomination. But more variety means more–and often overlooked–actors get considered. Actually, Stallone’s Rocky doesn’t fall into any of the categories. I only use him as an example because he doesn’t have the range of someone like Rickman.